Since beginning my glamorous randonneuring career in 2005, I’ve not only ridden in places I never imagined, but I’ve dozed in an assortment of spots I never before would have considered comfortable or conducive to sleeping. Ride long enough, sleep little enough, and you too will find yourself mastering the strategy of the perfect randonap. As the body pleads for rest, the eyes become sharper at identifying flat smooth surfaces the size of a person’s body. Benches, church parking lots, covered gazebos (particularly helpful if it’s raining), parks in a town center, and grass-lined ditches make for some prime randonap locations. Because domestic events do not have the same number of people participating in them, it’s more difficult to spot someone in the midst of a randonap. 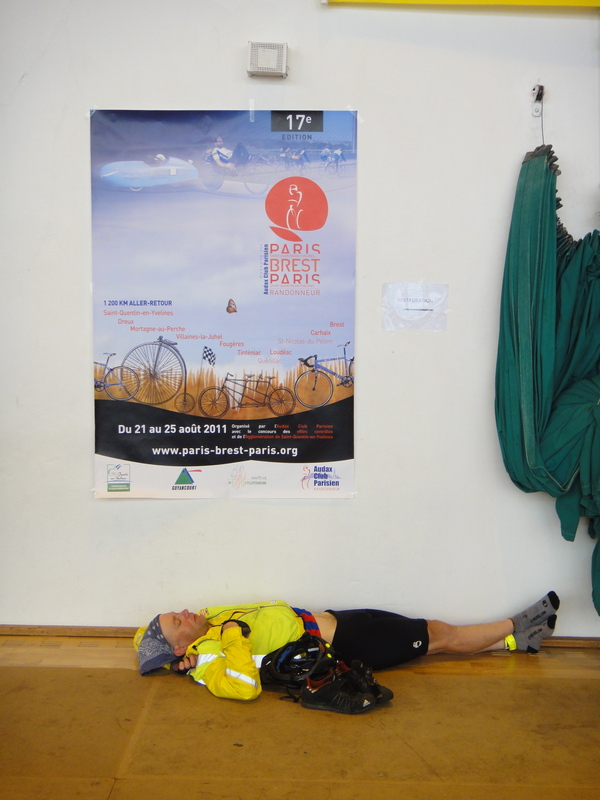 During the 2011 edition of Paris Brest Paris, though, we saw plenty of people demonstrating their mad randonap skills. 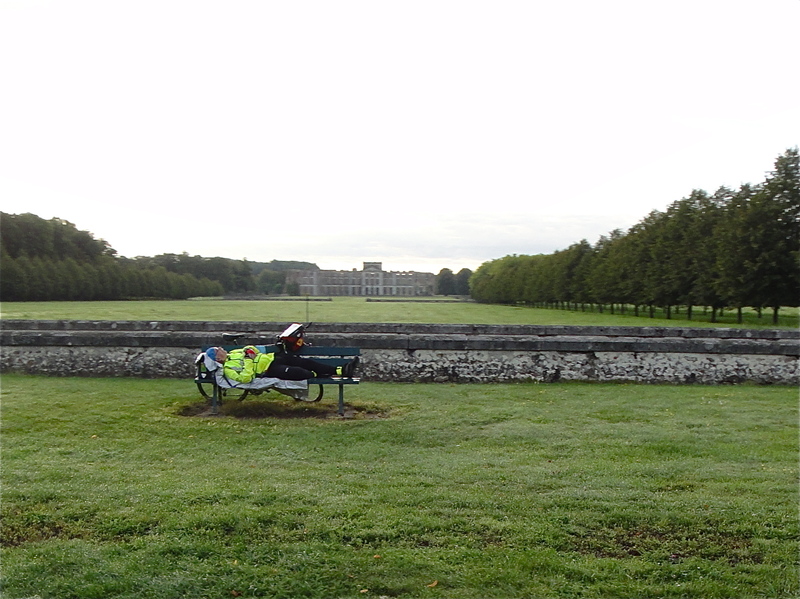 People could be found catching a few winks at controles and in the countryside. Many riders brought along mylar blankets to wrap themselves in while they slept. I called them baked potato people, while my friend Andréa gave them the title of human burritos. Others didn’t sweat the mylar blanket. 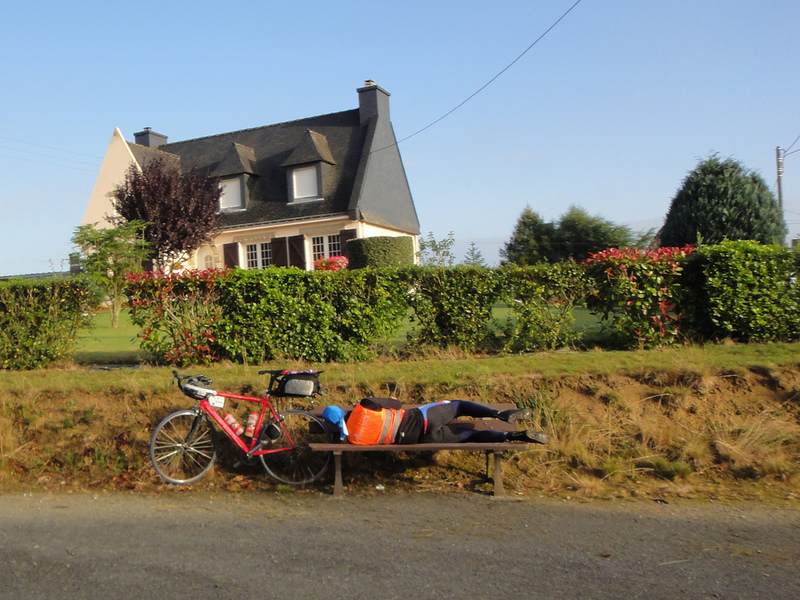 They identified their randonap location, dismounted their bikes, and closed their eyes for a brief snooze. The randonap contingent was particular visible on the final day of PBP. 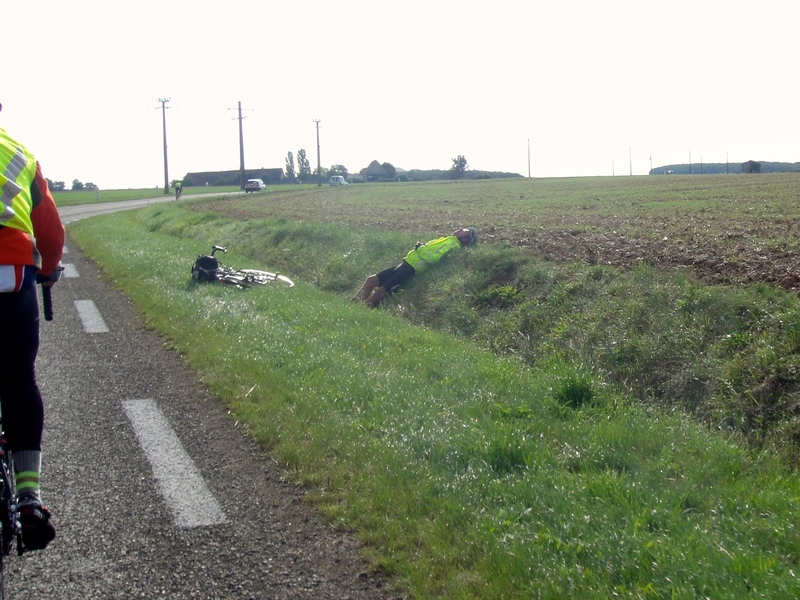 As we rode along, randonappers peppered the countryside. House, cow, randonapper. Barn, pasture, bench, randonapper. I’ve become a big fan of the randonap, especially during 1000K and 1200K events, even 600Ks. The reenergizing powers of shutting down for 15 minutes or so are remarkable, especially if you succeed in staking out a quiet open air location accompanied by a smooth piece of pavement or ground. Ahh, you randos know how good it feels! The randonap is kind of like camping, only with a brevet card in your hand, a bike parked nearby, the clock constantly ticking, and hundreds of miles crammed into your legs. The theme of randonapping is also a good conversation starter among rando-friends, say, at the post-ride pizza party or after you’ve had some real sleep. What’s the strangest place you ever slept? Best randonap you ever had? What are the best places for sneaking in a randonap? Don’t give away your secrets when you answer this last question. Craft your response carefully. You don’t want anyone stealing your most treasured randonap real estate. Ha ha, yes! I thought about adding something like that when I was writing and coming back to… so on second thought, really not like camping at all.